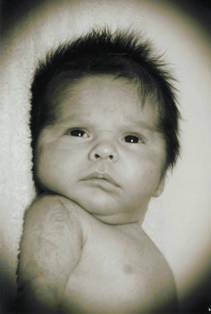 Uriah M. Stahlman, a descendent of Chief Cornplanter, infant son of Brad Stahlman and Holly Lyons, passed away Sunday, January 29, 2012 at home. He was born on October 27, 2011 in Olean, NY. Surviving besides his parents are: 1 sister, Alyssa Stahlman, Salamanca, NY; 3 brothers, Bryce, Bradley, and Blane Stahlman, all of Salamanca, NY; maternal grandparents, Wealthy Bucktooth, Salamanca, NY and Leonard Lyons, Onondaga Nation; paternal grandparents, Doug & Sandra Stahlman Sampson, Salamanca, NY; maternal great-grandfather Robert Bucktooth Sr., Salamanca, NY; maternal great-grandmother, Gertrude Lyons, Syracuse, NY; several uncles, aunts, great-uncles, great-aunts, and cousins. He was predeceased by a paternal grandfather, Charles Stahlman, Bradley Redeye, paternal great-grandparents, Edward & Doris Hill and Stewart and Inez Redeye Sr., and a maternal great-grandmother, Donna Bucktooth. Friends may call at the family home, 188 River Street, Salamanca, NY all day Tuesday and Wednesday. Services will be held in the family home Thursday, February 2nd at 10 a.m.